Once TR has been installed into a Slax server you can log into the system from your PC via Putty telnet. Here is a tour of what you will see. Configure Putty for the Slax server IP address. If you are logging in from your home network, use the LAN IP address of the Slax server. This can be found by logging into your router and viewing the listing there of machines on the network. You can also use a utility like Advanced IP Scanner http://www.advanced-ip-scanner.com/ to identify all the machines on your home network. If you have forwarded the appropriate ports on your router, you can log in to Slax remotely suing your WAN IP address – the one assigned by your Internet service provider. If you don’t know your home WAN IP, Chrome has an ap for your browser that will identify this. Here is the Putty log-in screen once the connection has been made. You are now connected to the Slax server. Log in using root as the user name and the appropriate password. Slax 7 Linux for TR is called a ‘rooted system’ because everything is done as the root user. Most textbooks on Linux will describe this as poor practice – but the TR server is a small system and not normally accessed by many users. Working with Slax as root is quicker and simpler than working as some other user name. index.html – This is the web page that users see when they access your TR system via a web browser. This file holds the TR player and descriptive information about the piece to be played. This is a very simply HTML page and should be compatible with mobile as well as full PC browsers. lpcfg.html – This is the configuration page that you use with your browser to set up the sequencing parameters of TR. Normally this is hidden from users of the TR player page. lighttpd.conf – This is the configuration file for the http web server. starter – A batch file that launches the httpd web server – run this just once after starting up Slax . track1.ogg – the music file mixed with one or two others to create the trackall.ogg file in the player. This file is created by the sequencer program. track2.ogg – As above, but for the second set of .ogg segment files. track3.ogg – As above, but for the third set of segment files – if used. trackallp.ogg – A music file created by mixing track1.ogg, track2.ogg and track3.ogg files. trackall.ogg – The final file linked to the web page player. wulogo.jpg – The Weather Underground logo image file. mq.jpg – The MapQuest logo image file. AAAA.ogg – A file used to introduce a delay of 16 or more measures into the S1 group of .ogg files. Used to provide audio continuity as the .ogg files fade in and out as they are played. cleaner.pl – a Perl program that deletes the files in the S0, S1 and S2 folders prior to a creating sequence. kyz.txt – A file containing 1 or 0 that is read by a controller program 4 times a minute. If a 1 is present, the controller program writes a 0 to kyz.txt, then reads a configuration file and executes the appropriate sequencing program. If a 0 is read in kyz.txt then no action is taken. This is how the configuration page communicates to the controller program when a new configuration is ready. lpc2.pl – A Perl program that accepts a new configuration from lpc.pl, writes the configuration to a series of files in cgi-bin and refreshes the webpage. postr.pl – This is a Perl program that writes the temporary web page that you see when TR is busy sequencing a piece. reseq.txt – A file containing the sequence type to be run during the next resequence. rnd.pl – A Perl program that runs a random sequence on the .ogg music files uploaded by the user. scords.txt – A file containing the coordinates generated by the sequence program. These will be used to copy the .ogg files uploaded by the user to /sourcetr in a certain order to create track1.ogg, track2.ogg and track3.ogg. seq.txt – A file containing the type of sequence to be run. staves.txt – A file containing information on the number of staffs in the piece, the number of files for each staff, the initial state of the TR players on the webpage and the total number of .ogg segments to be created by the sequencer. stk2.pl – A Perl program as above, but the US cities are grouped by time zone. title.txt – A file containing the title of the piece and the artist name. wea.txt – A file of weather data generated by the CURL call for Yahoo weather. wx1.pl – A Perl program that generates coordinates from temperature data for randomized US cities. wx2.pl – A Perl program that generates coordinates from temperature data by section in the US: north, south and west – for each player. wx3.pl – A Perl program that generates coordinates from weather data from 16 European cities – temperature, wind velocity and humidity. Other Files – There are various other files in this directory for running and organizing the various programs and algorithms. 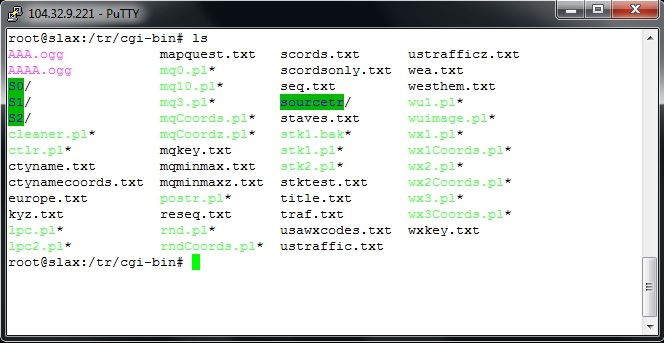 sourcetr – A folder containing the source .ogg segment files uploaded by the user. The files are named S0_000, S0_111, S2_001, etc. S2 – As above but for the third player and track3.ogg.